Hi Moda Bake Shop Readers!! I’m Melissa Corry from Happy Quilting and I am so excited to be back here at the Moda Bake Shop to share my Read With Me quilt!! This fun twist on a standard “book” quilt uses typography and adorable quilting to add a whimsical touch. Adding quilted titles of my families books makes this quilt a treasured heirloom. 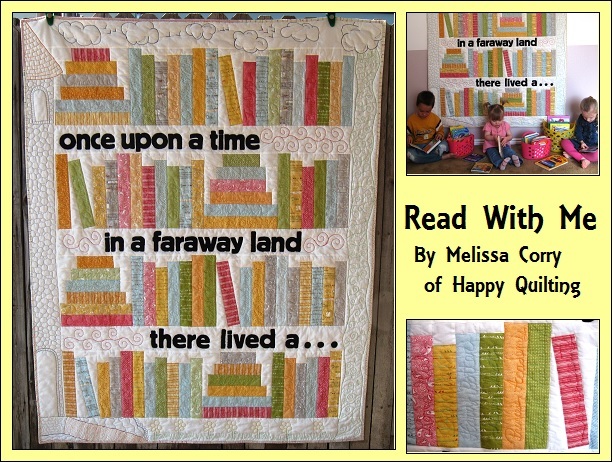 I hope you enjoy the tutorial and even more, I hope you enjoy creating your own Read With Me quilt!! Got your Ingredient’s, let’s get piecing!! Start by breaking out that jelly roll. Choose 7 strips and set them aside to be used for your binding. I choose to use the “white” strips for my binding. Gather the following size pieces and lay them out as shown. (1) 2 1/2″ x 2 1/2″ solid square, and (3) 1 1/2″ x 2 1/2″ rectangle. Lay the solid rectangles onto the tops of the print strips and sew a 1/4″ seam along the edges. Press. Sew the 6 columns together. Start by placing the second column onto the first, sew a 1/4″ seam along the edge. Then place the third column onto the now sewn together first and second columns and sew a 1/4″ seam and so on until all 6 columns are sewn together. Press. Repeat this step to make a total of 4 blocks each measuring 12 1/2″ x 12 1/2″. (3) 2 1/2″ x 2 1/2″ solid square, and (2) 1 1/2″ x 2 1/2″ rectangle. (2) 2 1/2″ x 3 1/2″ solid rectangles, (3) 2 1/2″ x 2 1/2″ solid square, and (3) 1 1/2″ x 2 1/2″ rectangle. Lay the solid rectangles onto the tops of the print strips on either end of the strip and sew a 1/4″ seam along the edges. Press. Sew the 6 rows together. Start by placing the second row onto the first, sew a 1/4″ seam along the edge. Then place the third row onto the now sewn together first and second rpw and sew a 1/4″ seam and so on until all 6 rows are sewn together. Press. Block D has an angled book. To make this start by slicing a 3″ x 15″ solid rectangle in half diagonally. 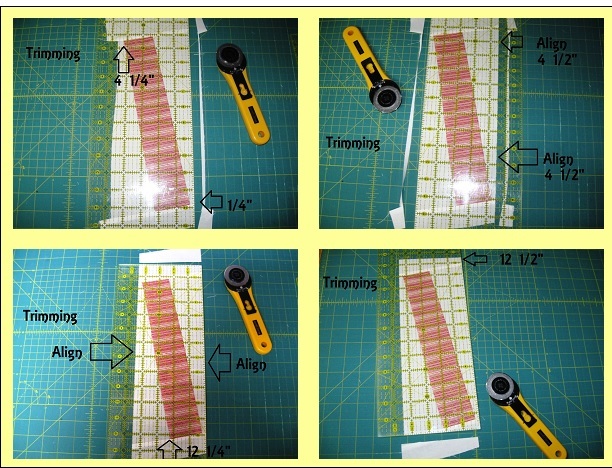 Place a 2 1/2″ x 11 1/2″ print rectangle between the 2 triangles, taking care to center the strip. Lay the strip onto the top triangle. Sew a 1/4″ seam aligning the raw edges. Press. 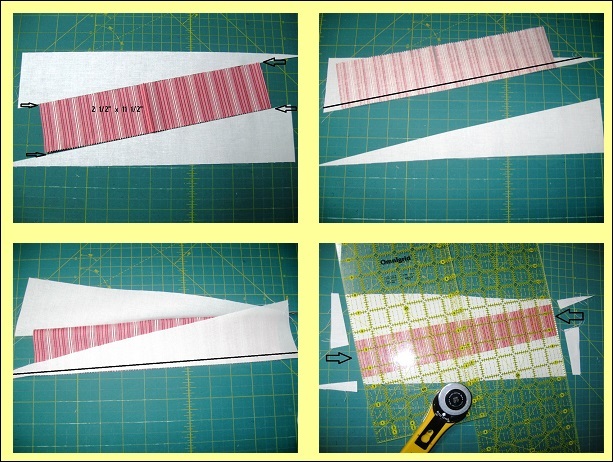 Lay the bottom triangle onto the strip and sew a 1/4″ seam aligning the raw edges. Press. Using the ends of the strip as a guide, trim the top and bottom of the unit even with the ends of the strip. Now gather a 2 1/2″ x 6″ solid rectangle and a 1 1/2″ x 6″ solid rectangle. Lay the 2 1/2″ strip along the bottom of the block and the /2″ strip along the top of the block aligning the raw edges. Sew a 1/4″ seam along each edge and press. Place your long ruler so the top left hand corner of the print strip aligns with the 4 1/4″ horizontal mark on your ruler and the bottom right hand corner of the print strip aligns with the 1/4″ horizontal mark on your ruler. Trim along the right hand edge of your ruler. Place your long ruler so the right hand side of the block aligns with the 4 1/2″ vertical line on your ruler. Trim along the left hand edge of your ruler. Place your long ruler so that the right hand side of the block aligns with the edge of the ruler, the left hand side of the block aligns with the 4 1/2″ vertical line and the bottom right hand corner of the print strip aligns with the 12 1/4″ horizontal mark on your ruler. Trim along the top edge of the ruler. Place your long ruler so that the right hand side of the block aligns with the edge of the ruler, the left hand side of the block aligns with the 4 1/2″ vertical line and the top of the block aligns with the 12 1/2″ horizontal mark on your ruler. Trim along the bottom edge of the ruler. You know you will have trimmed correctly if the three corners of the book that are pointed out are 1/4″ away from the nearest edge. (2) 2 1/2″ x 12 1/2″ print rectangles, (1) 2 1/2″ x 11 1/2″ rectangles, and (1) 2 1/2″ x 10 1/2″ rectangles, and a pieced angle book block. (1) 2 1/2″ x 2 1/2″ solid square, and (1) 1 1/2″ x 2 1/2″ rectangle. Sew the 5 columns together. Start by placing the second column onto the first, sew a 1/4″ seam along the edge. Then place the third column onto the now sewn together first and second columns and sew a 1/4″ seam and so on until all 5 columns are sewn together. Press. Grab the WOF strips cut in the beginning and cut them into the following pieces. Sew the pieces end to end to create (2) 5 1/2 ” x 63 1/2″ strips to be used for the side borders, (2) 5 1/2″ x 58 1/2″ strips to be used for the top and bottom borders, and (3) 48 1/2″ strips to be used for the applique. Set the border strips aside. Fuse your applique onto the three strips as follows. For the first strip, start the applique 1″ in from the left and space the applique out over 32″. For the second strip, start the applique out 8 1/4″ from the left and space the applique out over 32″. And for the third strip, start the applique out 1″ from the right and space the applique out over 32″. Secure stitch the applique. It is much easier to do this while it is in a strip, verses once it is sewn into the quilt top. And now you are ready to put the top together. Lay your 16 blocks out in 4 rows of 4. You can use the same layout I did or your own, just whatever looks pleasing to your eye. Once you have your layout, sew the rows together the same way you did with the blocks. Lay the second block in each row on the first and stitch along the aligned edge. Then add the 3rd block, and then the 4th. Press your rows and then lay them back out adding the appliqued strips in between each row. Sew the rows together. Once again, use the same process as putting the blocks together. Just sewing the second row onto the first, and then adding the third and so on until the rows are all sewn together. Now gather your borders that were set aside. Place the side borders along the sides of the quilt top. Sew a 1/4″ seam along the edge, aligning as you go. Press. Then repeat the same process for the top and bottom border. Press. And your quilt top is finished!! This entry was posted in Baby and Kids, Jelly Roll, Moderate, Quilt and tagged Errata, Happy Quilting, Noteworthy, Sweetwater, Typography Challenge.